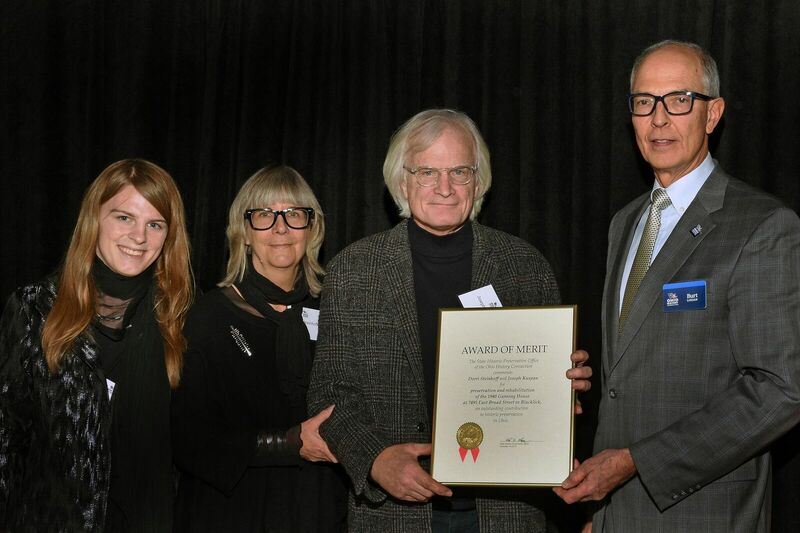 Dorri Steinhoff and Joe Kuspan were recently awarded a State Historic Preservation Office Merit Award for preservation and rehabilitation of the 1940 Gunning House at 7495 East Broad Street in Blacklick. It was a privilege to nominate Dorri and Joe for the award and we are thrilled they were selected for this honor. They are pictured at the Award Luncheon with their daughter Maren, left, and Burt Logan, Ohio History Executive Director, right. Dorri and Joe are credited with saving this significant residential property threatened with deterioration, vacancy and redevelopment pressure. Glenbrow, also known as the Gunning House, is a mid-20th Century, Organic Modernist house that embodies Frank Lloyd Wright’s Usonian principles of architecture as interpreted by Wright disciples, Tony Smith, Laurence Cuneo and Ted Van Fossen. Van Fossen, who was 19 years old at the time, went on to design Rush Creek Village. Glenbrow, built in 1940 with lime and sandstone that was quarried on site, and board and batten cypress horizontal siding, sat vacant and open to the elements for many years with only minimal maintenance since 2006. The site, tucked away off of East Broad Street near Reynoldsburg, highlights to perfection the integral relationship between landscape and architecture. Built into a hillside on a wooded ravine overlooking a bedrock bottom creek, floor to ceiling windows take full advantage of dramatic views. Columbus Landmarks featured the house on its inaugural Most Endangered Buildings List in 2014, which attracted the attention of Dorri and Joe, who purchased the property. David Vottero, Director of Architectural Design at Schooley Caldwell and a member of our Board of Trustees, advocated for the property for many years and helped envision the possibilities. Dorri and Joe, who is an architect, shared the vision, and applied their talent and fortitude to a three-year transformation taking the house from ruin back to architectural gem. Dorri and Joe did much of the hard work themselves and following a three-year process, now reside at Glenbrow, thought to be the most important Mid-Century building in Columbus. They documented the entire process and have already hosted tours for Columbus Landmarks and AIA Columbus. Stay tuned for a spring tour!